If you have seen the film “Call Me By Your Name”, a love story that takes place “somewhere in Northern Italy”, the likelihood is that it left you itching to experience the romance of the region for yourself. Although the tag line is vague we have pinpointed the locations in Lombardy in the northwest of Italy. This means all you need is three days to explore and be guided by the story of 17-year-old Elio Perlman (Timothée Chalamet) and his professor father’s 24-year-old graduate-student assistant, Oliver (Armie Hammer) as it unfolds in various locations around this region. Built along the river Serio, the city of Crema is dominated by its Duomo, a church built in the gothic style almost 700 years ago. It rises out of “Duomo Square” and is surrounded by pretty terraced houses painted in rose pinks and soft yellows. 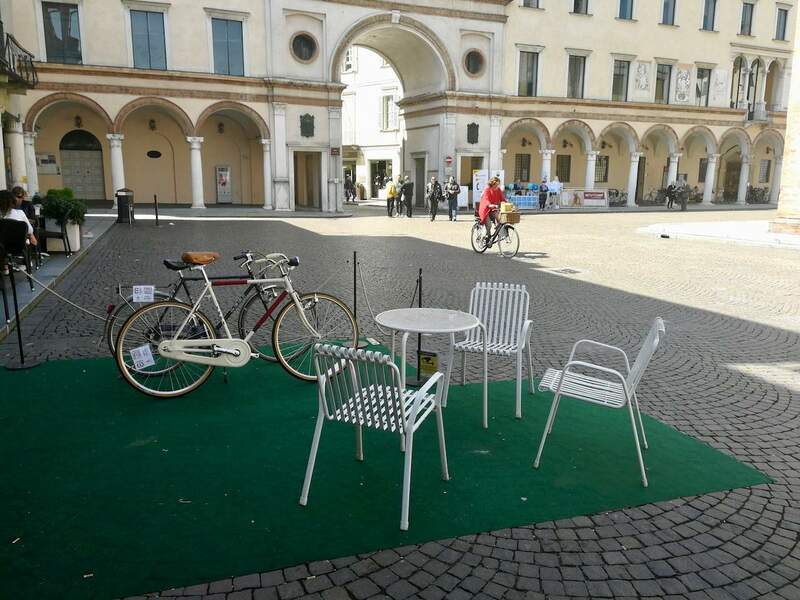 Several major scenes in the film were shot in Crema including one shot in the Duomo Square, where Elio and Oliver awkwardly engage in conversation, before Oliver jumps on his bike and cycles off, leaving a slightly bewildered Elio in his wake. The Duomo Square looks particularly lovely when bathed in the soft glow of sunlight, and true to form locals on vintage bicycles meander gently over the cobbled floor. Where to eat : There are several eateries dotted around the square, most with outdoor seating. At Trattoria Quin, a cosy restaurant with traditional furnishings and wooden beamed ceilings, try some deliciously light asparagus risotto as well as a local dish, Tortelli Cremaschi. The sweet filled pasta contains 16 special ingredients and had a unique chocolaty consistency. Lake Garda’s crystal blue water and crumbling ruins have long made it a popular holiday destination. Situated at the foot of the Italian Alps, the vast lake covers 370m 2 and its shoreline is divided between the regions of Lombardy, Veneto and Trentino-Alto Adige. 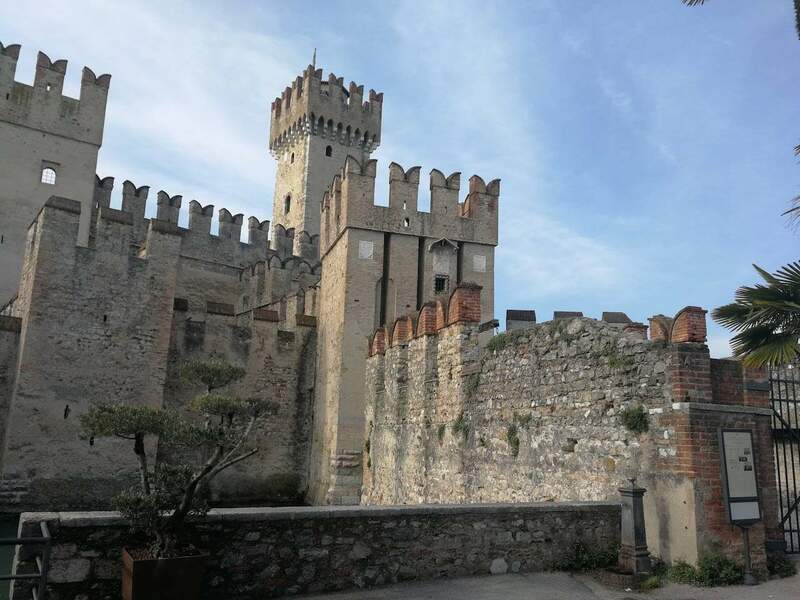 One of Lake Garda’s most picturesque towns is Sirmione in the Lombardy region, which pre-dates the Roman era and contains a 13 th century fortified stronghold, Scaliger castle, that looks out on to the lake. Only around 150 people live in the old town, which is dominated by narrow, cobbled streets, tourist shops and restaurants. 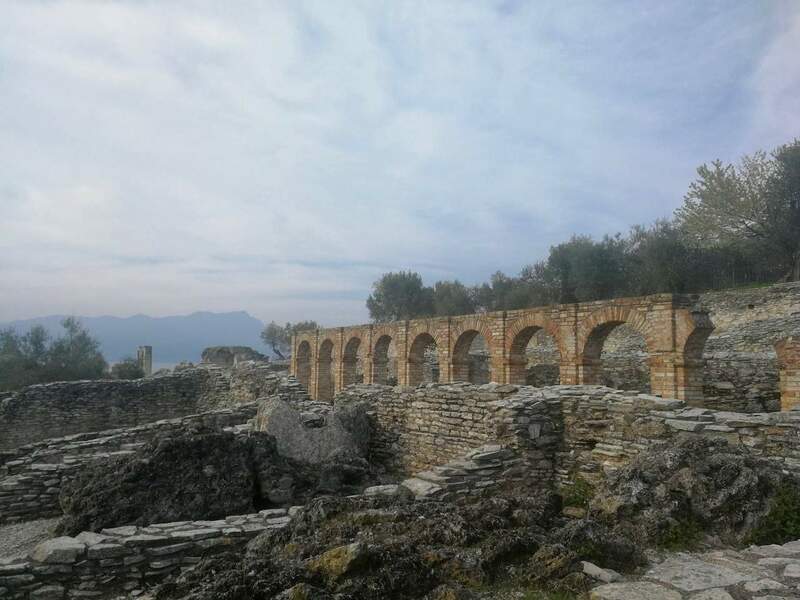 This is where Oliver, Elio and his father walk through the decaying arches towards the “hall of giants” and wade into the lake, where they discover a beautiful bronze Roman statue. The lake is called “Jamaica beach”, so named because the flat, overlapping rocks on the lakebed look like sand from afar. Oliver and Elio shake hands on this beach (via the broken arm of the bronze statue) and sparks fly. Where to eat : Il Girasole in the old own of Sirmione has a large outdoor seating area and serves delicious Italian cuisine at excellent prices. Try the five-course fish menu which includes a tangy plate of seafood carpaccio and a light and tasty pannacotta. 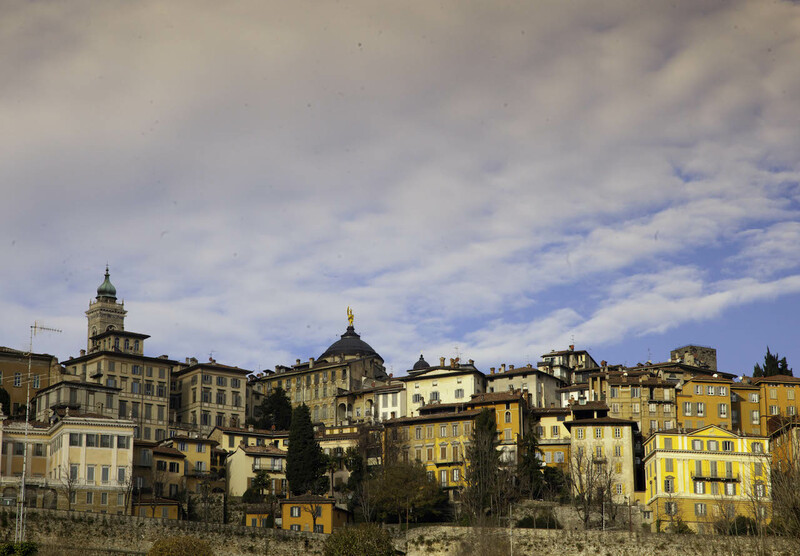 The sprawling city of Bergamo, famous for producing San Pellegrino sparkling water, is 40km northeast of Milan. The city is divided into two parts: the old 12th century walled core high up in the hills known as Città Alta (“Upper Town”), and the densely urbanised modern expansion in the plains below. The upper town is encircled by 6km of ancient Venetian defensive walls, which were awarded UNESCO heritage status in 2017. To reach Città Alta from the lower town you can either drive or take the funicular. The old town contains 14 churches, one of which is now a library. The streets are lined with terraced houses with swirling metal balconies and neat, white shutters. 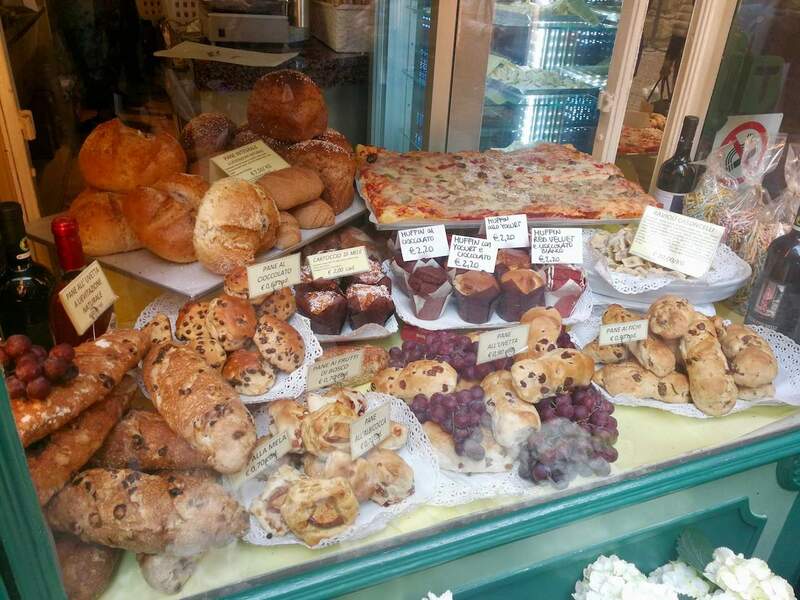 There are plenty of eccentric shops (such as one dedicated to selling hair flowers) and bakeries full of sweet pastries which are well worth a mooch. Just a few minutes’ walk from the Piazza Vecchia is the “Cappella Colleoni” church and mausoleum, which is decorated with opulent marble embellishments in white, red and black. Built as a personal shrine for the military “Condottieri”, Bartolomeo Colleoni, the church also displays Colleoni’s rather memorable family crest: three pairs of testicles to remind the world of his strength and machismo. 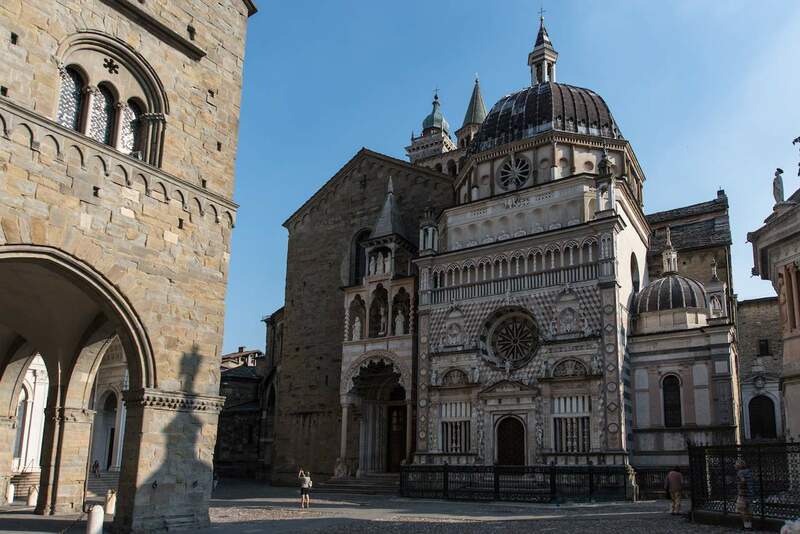 Bergamo marks the point where Elio and Oliver’s love is proudly set free with several scenes expressing joy and laughter, as the lovers get drunk, dance in the street and frolic in the neighbouring countryside. As you stroll through Città Alta you may notice the doorway where Oliver joyfully dances with a female stranger as Elio lovingly looks on, until the boozing gets the best of him. 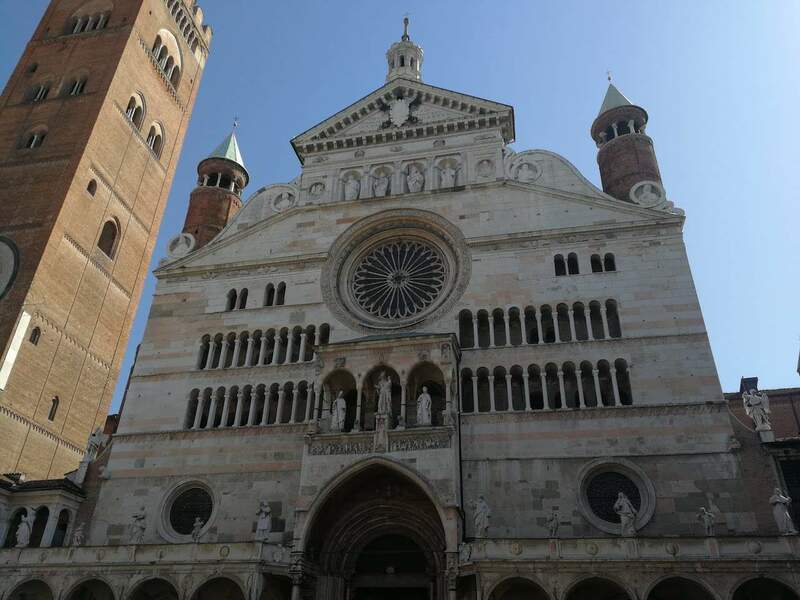 The city of Cremona is just a 45-minute drive from Crema, and has a stunning cathedral with one of the tallest brickwork bell towers in the world. 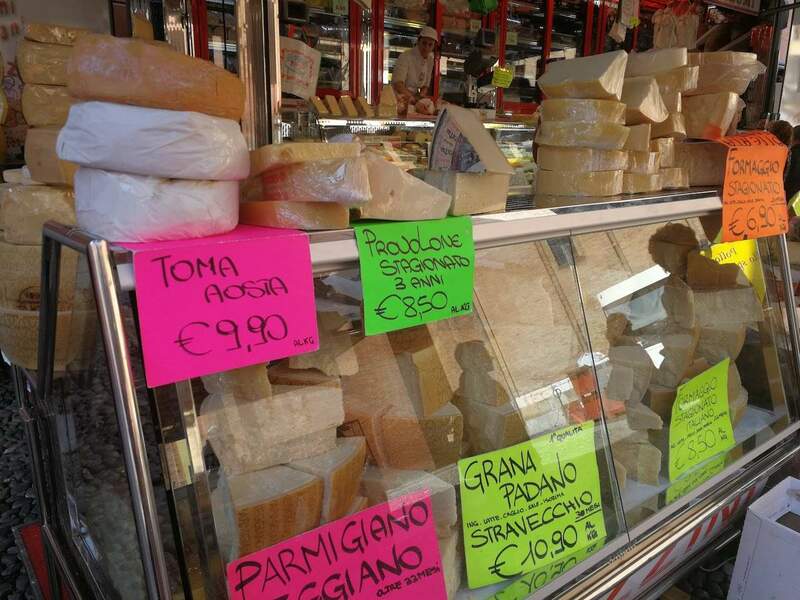 There is a vibrant market opposite the cathedral that runs every Wednesday and Saturday, selling local cheeses, cured meats, vegetables and flowers. Cremona dubbed the “Violin capital of Italy” is where Stradivari was born in the seventeenth century. The tradition of violin making is still very much alive and there are 164 violin-making workshops. The excellent Museo del Violino exhibits some of the most valuable violins in the world, including several made by Stradivari himself. Book a group tour to one of the violin-making workshops and learn about the art of the craft from one of the masters.